Series: "Texte aus der Geschichte." edited by Bas Leenman. Talheimer Verlag, Mossingen-Talheim, Germany 1988. In the aphasia that reigned in Europe after the end of World War I, Rosenstock-Huessy was searching for ways to renew speech. After having fought at the front near Verdun for several years and having witnessed the devastation of Europe, he believed that male speech was no longer fruitful and had come to its end. In his moving essay, Die Tochter (The Daughter), Rosenstock-Huessy introduces daughterly speech as the cure for mankind at this point in time. 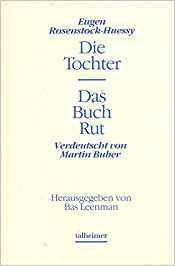 At the instigation of the author, Bas Leenman brought this essay together with Martin Buber’s translation into German of the Book of Ruth. The publication was made possible by the Stichting Eugen Rosenstock-Huessy Fonds in The Netherlands.